The 2017 OzAsia Festival’s visual arts program takes viewers into magical worlds of history and legend and worlds of harsh reality. In telling of catharsis, identity crises and soul-searching and of the need for both travel and home, these well-chosen exhibitions reveal much about Asia and about ourselves. I review three of them here and the impressive Macau Days in a separate response. You enter Doris Wong’s installation through a black curtain to find yourself in a place resembling a street at night. There is brick paving with weeds poking through, a litter bin, a street lamp, a phone box and just enough illumination to allow you to navigate. But inside the litter bin is a repeating video of a light bulb glowing brightly and then exploding. The street lamp is upside down and in place of its globe is a small moon. The weeds are painted silver and there are two more videos on large screens, one showing planet Earth rotating and then suddenly being snatched away by a child’s hand, and the other showing a passenger jet also rotating as if controlled by unseen forces. The phone in the phone box rings and when you answer you hear a voice ruminating on why life seems so miserable and how you might move from a negative to a positive frame of mind. Doris Wong is an established Hong Kong artist whose work has always been strongly conceptual, but in recent years it has exhibited a mystical quality (read an interview with the artist). Her exhibition, A place never been seen is not a place, represents a shift in her work, and it’s accompanied by a small bilingual booklet in which she sets out the thinking behind each of the five works in the installation. Each has a sentence as its title: “A place never been seen is not a place” is also the title of the moon suspended in the inverted street lamp. Wong is concerned with the proposition that “space and time do not actually exist, but are tools to understand ‘reality’.” By offering us a reality that does not conform to our understanding of it, she provokes us to rethink our perceptions. What is the right way up? How does the moon affect our lives? 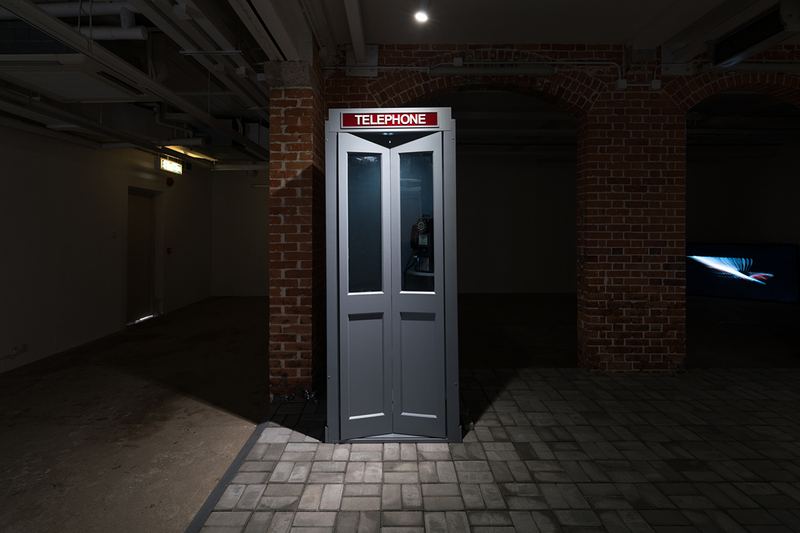 “You have already heard the most important story in your life” is the title of the phone box component of the installation. It refers to an occasion when Wong was staying in a hotel room and the phone rang. She heard voices, and though the call was presumably the result of a technical fault, she wondered if she had missed an important conversation. Subsequently the event became imbued with mystical significance since it prompted her to question her own awareness of potential communications with inner or other worlds. “What lies inside you is not a person, but personality,” is the title of the exploding globe in the litter bin, a metaphor suggesting we are all repositories of discarded ideas. Doris Wong also suggests that some people have different personalities in their dreams. They have no fixed identity; their identity is their own creation. The video of the spinning world grabbed by a child’s hand, entitled “Since you were born, I have realised the universe is full of kindness,” is a reference to the birth of her son, the day of his birth being the only one when the universe seemed kind. The spinning passenger jet, entitled “You choose the safer side,” mimics the spinning Earth but also suggests a plane crash. Wong cites an American hypnotherapist who believes that souls choose their destiny, while the two videos placed opposite each other collectively suggest that supernatural powers control our lives. Wong’s installation is a stage with you, the visitor, as the actor, inviting you to rethink your beliefs. Her work recalls various New Age philosophies and an essay by Anthony Yung in the booklet discusses the aesthetics of occultism. For me, Wong’s exhibition is about the unreliability of perception and comprehension, and the human tendency to fill gaps in understanding with imaginings. We explain what we don’t understand as being the work of god or some other paranormal force and Doris Wong’s exhibition obliges us to admit to this tendency. This absorbing group exhibition, curated by Ding Fengqi of the Chengdu Blue Roof Museum, showcases performance art in Chengdu, a city of over 10 million in China’s Sichuan province. Artists there have been leading the development of performance art in China, and the exhibition’s works dwell on the personal and social impact of rapid social change, urbanisation and evolving personal values and customs. Tong Wenmin captivated the opening night audience with a live performance entitled A Silent Discourse, in which she grasped a hot light bulb with a hand covered in honey, the softening substance dribbling onto the floor. She then ground charcoal into powder, smearing herself with it. The catalogue quotes the artist as saying, “Language cannot fully express ideas, and sometimes becomes a trap in itself… Through the exploration of the body movement and physical structure, in a specific time and place, we may be able to search and approach the truth, where we can seek peace and retrieve origins.” This view seems to characterise many of the works in the exhibition and the idea of performance art generally. 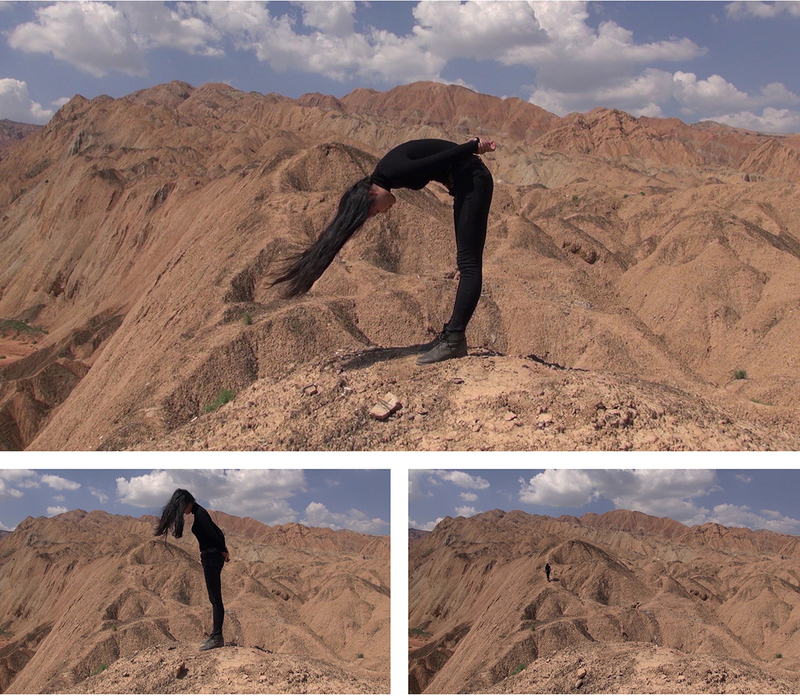 Tong’s video, Flying Wind (2016), shows her standing bowed forward on a windy, desolate, rocky mountain ridge. Her long hair — barely visibly weighted with stones on the ground and connected by threads to her hair — becomes a part of the arc of the body, a living sculpture until she walks off into the distance. The work apparently expresses the artist’s interest in wilderness and its contrast with the urban environments to which she is accustomed. Wong also showed two juxtaposed videos from her HW Factory Project (2016): Factory Program. Forge Iron shows her in a range of simultaneous screen images hammering hot iron at a blacksmith’s anvil. In Sleep, again in multiple frames, the artist rests, sleeps on and rises from beds made in the factory. These works perhaps suggest the exploitative nature of intensive industrial labour and the use of outdated technologies. Next to the videos are photos of the work produced — the ‘products’ are pieces of mangled iron, suggesting the futile nature of earlier industrial production. Zhou Bin’s two works are compelling. His Diary (1986-2015) features a video of the artist cathartically pulping the diaries he kept from 1986 to 2015 and converting them into fresh paper, available for reuse, as if he is turning himself into a tabula rasa. The resulting stack of fresh paper is displayed in the gallery beneath the video, symbolically inviting us to overwrite his life. Zhou Bin’s use of traditional papermaking methods speaks of occupations that are disappearing and the video also evokes the erasure of the self in an online, non-paper based world. For his other video work, 4000 Miles (18-23 August 2015), Zhou Bin made a bronze cast of his own head and then dragged it behind his car as he drove 4000 miles from Chengdu to Xi’an, one the city he was born in and one where he now lives, and back again. As the bronze head scrapes along the road, it slowly wears down on either side, leaving only a thin outline of his head in profile. The resulting object is displayed adjacent to the video, the journey and its outcome symbolising the wearing down of the self by the contemporary world. Li Liang’s work Father 1927.12.03 – 2010.08.27 is a sequence of photographic images of the artist’s father, including images of him as a boy and as a frail old man facing death. The artist was concerned that his father’s life — all 30,219 days — should be remembered as more than the hyphen connecting his dates of birth and death. So, in a painstaking homage, he carefully wrote all the dates of his father’s life in tiny print over the photos. Award-winning Photographer Zhang Kechun’s Between Mountains and Rivers is a sample of four colour images from a large-scale series that documents changes to the Chinese landscape resulting from development. His documentary photography represents a personal journey and the compositional style and flavour of his work recalls the romantic sublime of European artists such as Caspar David Friedrich, except that here we see humans dwarfed not by virginal, awe-inspiring nature but by an environment disrupted by human intervention. 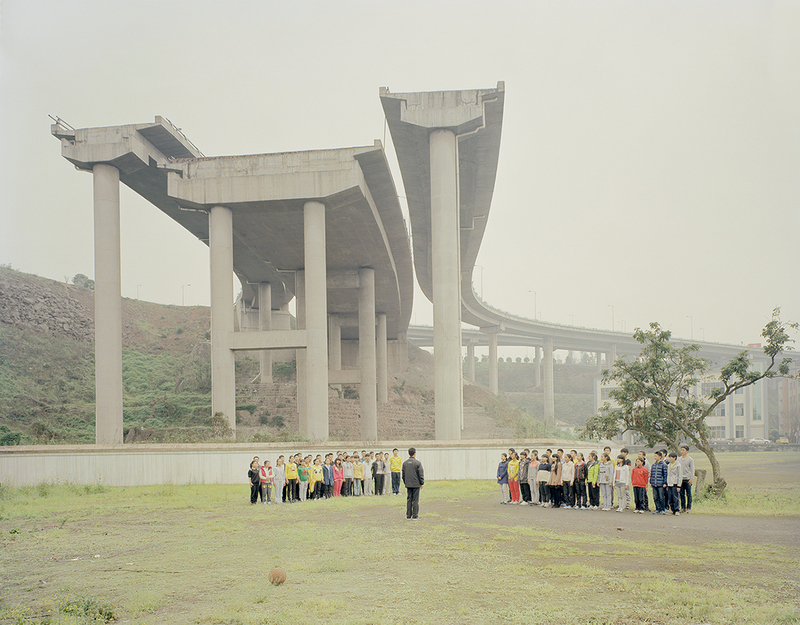 One image is of a group of people gathered in teams beneath a gigantic but incomplete bridge, a freeway that abruptly ends in mid-air — its construction presumably discontinued sometime before. Zhang’s eloquent art comes at a time when despoliation of the planet has reached crisis point. 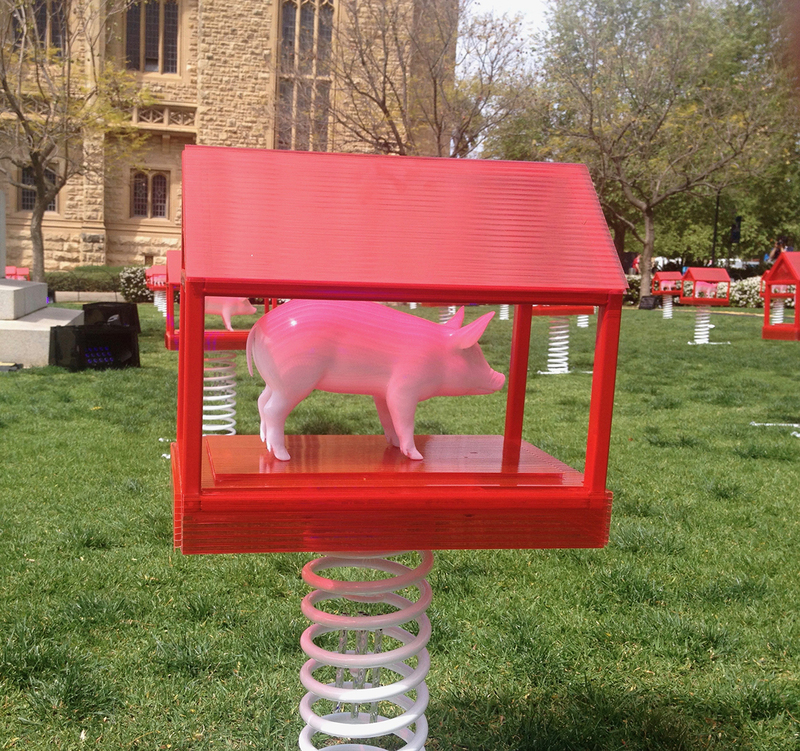 Hong Kong musician, composer and inventor of musical instruments, Gaybird (Leung Kei-Cheuk), is also a visual artist, and his installation Home, on the Goodman Lawns outside the University of Adelaide’s Elder Hall, is a delightful but telling statement about what home might be. The installation comprises 72 tiny houses of reflective red plastic set on springs on the lawn, their neat rows suggesting tidy suburban streets. The houses are shaped to mimic the roof-line of the Elder Hall and each contains a white toy pig facing the street. Beneath each house is a wind chime, and if you gently push a house the chime rings, representing the sound of a doorbell signalling arrival and hospitality. Gaybird says that his “intention in making new instruments is to explore how to use bodily gestures to create sound.” Home invites us to make sound by activating the houses on springs, and at the exhibition launch, adults and children alike enjoyed playing with the sculptures. But the work has a serious side. Gaybird says that it is inspired by a visit to Adelaide earlier this year — “It is a peaceful city, well-balanced between urban and suburban areas,” he says. Each little house represents the ancient Chinese ideogram for ‘home,’ a roof with a pig or boar underneath representing the owner’s wealth, security and food. “All that is needed to make a home is a roof and food.” His simple work asks us to think about what we genuinely need to make a home. In the context of this OzAsia Festival, which explores issues of migration and cultural identity in many performances and artworks, Gaybird’s installation asks us to consider the meaning and importance of having a home, something we should not take for granted in our peaceful, welcoming city.